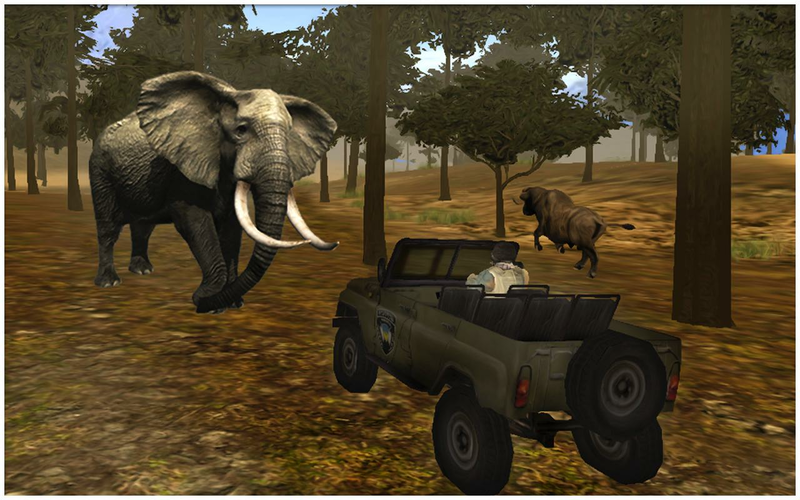 Animal Shooting Safari Hunting 4x4 is an ultimate hunting adventurefor real hunter in the African continent, In this real huntingsafari game first action to grab your gun & drive your safari4X4 jeep and go for hunts. Be a brave huntsman to hunt Deer, Tiger,Cheetah, Lion, Lioness, Elephant, Giraffe, Deer-stage, in mountainand jungle fields using Sniper rifle. You must has the embarkdecision in the hunting expedition in such best hunting safarigames to go with next games missions. Wild animals huntingexperience in the dark Jungle to show your driving & shootingskills. Animal Shooting Safari Hunting 4x4 game has one of the bestsniper shooting and hunting experience for wild animals. In thisgame you are driving and walking alone in the forest, equippingwith unique killing weapons, aiming at the powerful dangerous biganimals is around the green fresh African jungle areas. There are alots of astounding and action levels with stylized wilder animaland realistic thrilling environments and jungle sounds; you canalso feel marvelous effective sound of weapon shooting and safarianimals violent in this addictive simulation. Aim, shoot and Kill,be the perfect hunter, use your modern deadly sniper rifles andfirearm to take the exciting shot with unlimited ammo and powerfulpierce bullets.Take your shooting rifle and kill them all. Hugeanimals have strike on forest so be alert, hold your breath, aim& fire with unique weapons and ammunition! Frontline shooterhas responsibilities to save the jungle life and war with animals.Eliminate them one by one quietly.Animal hunting tips and gamefeatures :You will start from buffalo hunting to enjoy the realhunter beef and then move towards killing huge animals like bears,elephants, gorilla. Pass each scenario for each animal and unlocknew kinds. Difficulty levels in each level are different fromothers. Follow the instructions like hunt dear, loin hunting stage,elephants hunting level, zebra hunting, gorilla hunting andHippopotamus game levels etc and don’t get run out of time. Shootas many animals as you can and become an animal shooting veteran asyou advance in the game. You have to hunt down the huge white bearsand the rainy weather is making you senseless, shooting the deer indeep jungle is melting you mind with heat. Multiple game huntinglevels mean different kinds of weathers as well. There is nothingbetween your firearms and the wild lions and wolves for huntingadventure. Lonely survival in a wild island and African jungle. Somust utilize army lone survival skills for shooting to survive andfight against safari animals.Hunting Safari game features:• Huntinganimals, Animal shooting game • Best hunting simulator SAFARI 3Dgame.• Both hunting game play as FPS (First Person Shooting ) andTPS Third Person Shooting• Enoy besr driving off road on luxury4x4.• Beautiful graphics and realistic safari game environments.•Realistic animated animals to be hunted.• Sounds of Africa,enhancing the reality effect.• Wilderness of Assault shooting gunsto kill.How to Hunt :• Be careful, wild animals are dangerous andcan attack people.• Select your favorite weapon and start themission.• Switch between jeep riding and hunting simulation.•Select your desired driving option, i.e. steering or tilting. • Forbest shooting results - use the scope. • Do not approach your preytoo close - you will frighten the animal away.It is the real 4x4safari hunting game with your best choice hunting safari game.Youwill find the best animal hunting 2017 games in our JACI Technologyaccount. Chained car animal Hunting Sniper Shooting Expert is fun when oneis an expert seeker as a beginner will jeopardize his life inendeavoring to slaughter enraged monsters. chained car classic wildanimal hunter 3d 2017 amusement is a shiny new genuine chasing andexpert sharpshooter shooting knowledge which you won't notpossessed the capacity to get in your genuine living. The chainedcar individuals who can't chance their life chasing wild creaturescan appreciate genuine chasing knowledge by playing this wild lionmountain jungle legend hunting amusement on chained car.Soundsimpacts and music will take you into the universe of the primaryindividual shooter in this .extreme real animal sniper junglehunting amusement chained car .Feel as though you are there andencounter genuine battle by playing safari animal attack shooterendless fun chained car.Play virtual wild animal hunting rescue 3dand Shoot your way through an immersive, chained car completelyacknowledged 3D progress finish with phenomenal undead activitysand illustrations.sniper contract gunshot fire killer war is thefollowing level in cell phone first individual shooters on chainedcar.★★★ STORY ★★★ You want to chase, and in this army sniperfrontier animal safari hunter with your best expert riflemanshooting weapon . unsafe creatures out there, pick between deer,bear, hog, fox, wolf and rhino focus and shoot. You have 5 levelsto play with every creature. unending fun here. In this survivalanimal forest escape hunter freeamusement Animals feel wildernessas their ideal haven. When somebody gets into it they take it as atrespasser. So the expert rifleman should hold his breath and bepatient.In this wild zombie sniper survival island hunting3damusement While chasing bear and wolf know, they will end upnoticeably ready hearing the sound of slug discharge and willassault on you and on the off chance that you won't rush thesurvivor mammoth will set aside no opportunity to murder you andthis shark attack hunting rescue mission freediversion will befinished. In this hunter real jungle extreme shootingWhile stag orreindeer flee hearing terminating sound. The objective of killingrunning creatures is a bit of testing. So use in this real monsterjungle safari sniper hunting diversion your armed force expertrifleman shooting aptitudes to murder these creatures previouslythey assault or flee. In this wild lion mountain jungle legendhunting amusement Hunt crosswise over on the planet's mostnoteworthy chasing knowledge. Wilderness Animals Pro Hunting HD isabout excite and fun. Deer, lion, bear and fox is an insanecreature so to be an expert creature seeker you should have greatpoint and shoot aptitudes while holding your breath. You are on awild animal cheetah rescue hunting in a thick timberland conditionwhere you need to chase sharp creatures in a predefined time. Inthis bravo classic wild deer mountain hunter experience yourshooting and chasing skill ought to be at standard to win thisimmersive test while getting a charge out of a best seekerinvolvement in crazy safari lion hunting sniper adventure2017.which have wonderful and thick woods in a winter season sortof condition. Every seeker killing mission on each hungry wildanimals sniper hunting attack will convey you to fresh out of thebox new and energizing territories of the woodland wild and makeyou test your shooting abilities and deer following aptitudes.Prepare to wind up plainly a most gifted expert marksman seeker inultimate forest animal hunting adventure 3d game. Your Feedback,Ratings and Comments are significant for us. Animal Hunting SniperShooting Expert Elements: - Absolutely allowed to play - Multiplesorts of creatures targets: - 3d lovely shooting condition - Easyand smooth controls - Console quality HD illustrations - Realisticsounds - A consistent with life chasing knowledge. - HighDefinition illustrations. Hunt for real animals in hunting safari now! In this escape missionyou will have to use all your skills for survive in this jungle!Shoot at dangerous crazy animals. Unleash skills for shooting assniper shooter. Don't let the deer escape. Come of age, like a realhunter, improve your tracking skills, stalk your prey, and put yourhunting skills to the test in the hunt of real wild animals. It istime to load out your weapons and get your 5 star shooting fix!Angry Gorilla is in the crazy jungle and attacking on animals byits big punch to survive. Lonely survivals on a wild island.Utilize Army lone Survivals skills for shooting to survive andfight against animals and find escape from the hunted Island. Huntdifferent wild animals like Tiger, Heyna, Cheetah, Lion, Lioness,Elephant, Giraffe, Deer-stage, Gorilla, zebra, Elephant,Hippopotamus and Buffalo. Use your sniper gun to shoot them. Killor be killed, be a part of ultimate battle between you and willdangry gorilla. In deer hunting games you just have to shoot deerwith your gun or riffles but in lion and wild animal, hunting theseanimal can attack on you and can kill you. Show your brutalattacking skills to hunt down wild beast in the jungle and saveyourself from their counter attacks in this survival island.Utilize your action, fighting and shooting skill to escape. It’s amission on deadly shores to survive. Plan the Mission to escapefrom the dangerous Island to survive and return back homes. Braceyourself for the ultimate Deer hunting experience. Rival businesstycoons conspired to keep you locked up, now it's time to take yourrespect back. You are equipped with a modern deadly sniper rifle tohunt the wild beasts. Even from old era soldiers are trained asarcher shooters and they also learn archery hunting. All warriorsand knights were expert in hunting the running animals at jungleisland. Hunt safari animals & escape life safeguard missions.Deal with the counter attacks of these beasts with unique combos.Knockout monkeys before gorilla rampage at safari. Arm yourselfwith shotguns, pistols, assault rifles and the latest militarygear. Will you become a famous big-game hunter that kills the bigfive of zebra, elephant, and bufallo? Escape from an Island like areal survivals hero to struggle for your freedom. Survival landadventures begins with a hard time from lost Island along withwilder tiger. Go for hunting adventure and sedate angry gorillabefore it attacks and kills you. Game includes deadly attacks,extreme wilderness, survival escape missions and you need to be asurvivor hero!! Hey commando have you got all skills, army commandotraining test, power, assault shooting and wilderness to evolve asbrave hunting warriors in this thrilling adventures game for a lifeescape mission. Test your sniper skills by choosing targetscarefully; or go into assault mode as you clear the forest of thewild beasts! Become the best commando on this survival islands.Trap carnivore and predator animal in jungle sniper. Use all thepossible tools and weapons to defend yourself from wildernesscreature. Game Features : • 12+ real animals, 6 deadly weapons andmultiple missions. • Realistic Shootings with Guns effects,animations and sounds. • HD Jungle Autumnal environment, Efficientgun control and Camera zoom to get accurate shots. • Wilderness ofAssault shooting guns to kill. This is the perfect huntersimulators for you to play and it's totally free! Your Feedback,Ratings & Comments are valuable for us. Thank You! Enjoy the biggest unique shooting and hunting “Safari Wild HuntingAnimal” 3D game on 2017. Become a deadly sharp hunter; enter to thedark forest to hunt or kill the huge safari animals with test yourbest sniper skills and show your real assassination experience. Inthis modern “Wilder Animal Big Hunter” competition you are walkingalone in the forest, equipping with unique killing weapons, aimingat the powerful dangerous big animals is around the green freshjungle areas. This wonderful simulator is here for your greatenjoyment time with Lots of astounding and action levels withstylized stunning graphics and realistic thrilling environments;you can also feel marvelous affective sound of weapon shooting andsafari animals violent in this addictive simulation. The deadlysafari animal’s killer simulation is full action base addictinggame and it’s absolutely free. Aim, Shoot and Kill, be the perfecthunter “Deer Wilderness Hunting” game, use your modern deadlysniper rifles and firearm to take the exciting shot, this wonderfulsniper weaponries are especially designed for delivered to besthandgun with a specially controlling zoom, unlimited ammo withpowerful pierce bullets. You are equipped with many weapons likesniper gunfire. Use suitable handgun according to the situation.Prove That, You have the best hunter and show sniper abilities toshoot down the safari animals. Some amazing hazardous safarianimals are spread around the rain forest, destroy the freshlyplace and killing the other wild animals. In this “Animal Huntshooting 2017” your mission is walking alone in the green freshjungle, equipping with unique killing weapons, aiming at thepowerful dangerous big safari animals is around the green jungleareas. Dangerous safari animals have many powerful and too long, sothe mission of the hunter is just about to being. You are requiredto hit the focus on your target indicate by arrow and do not letthem loss from the scene. Take your sniper rifle and kill them all.Huge animals have strike on forest so be alert, hold your breath,aim & fire with unique weapons and ammunition! Front lineshooter has responsibilities to save the jungle life and war withanimals. Eliminate them one by one quietly. You need to completethe task in the given specific limited time. Kill given animals andcollect cash to easily unlock the more missions and powerful sniperweapons.You will enjoy real 3D environment of forest with safarianimals hunting. Jungle track is also a wonderful adventure andkills the dangerous animals. In this game you can also test yoursniper shooting skills in safari hunting. You will be givenmultiple time bundle tasks in this shooting mission. This “SafariAnimal Sniper Hunt” game is free to play for smart phone users alsoaccessible on Google play store! You can download it and enjoyexecute the greater dinosaurs in multiple difficult levels i.e.animal hunting game free. As a professional hunter, you are calledto lose or execute the dinosaur, they are walking on the jungle,find your goal which may available into hidden the forestry as asniper hunter. You will be given a specific time to complete yourmissions of animal hunting game. In this “Wilder Animal Big Hunter”game we provided to latest hunting weapons, you can easily hit thetarget. Features of Animal Hunting Games 2017.• Jungle environment• Hunting animal mission• Thrilling game• Fun and joy of hunt•Realistic sound • Best controls• Single person game playIf you haveany curry about this game or anything you would like to share withus then contact or email us. We are always here to help youout.Thank you for your support. Lion Hunting game is nowhere for you to have memorable ridingon the safari jeep and after reaching in the middle African jungleyou have to hunt the lions & deers in the jungle. The jungle isfull of wildlife animals like deers, lions, elephants and foxes etcand you have to hunt them to complete all the levelssuccessfully. Get ready to enjoy sniper hunting jungleanimal game in which you have to aim, shoot and kill differentwild animals like deer, lion, wolves, tiger, rabbit, hen, buffaloesetc. You have to be a sharp sniper hunter and put the triggerprofessionally to hunt the jungle lives. This real shooting forestanimals vs sniper hunter game is an exciting andthrilling simulation to align the gunshots and you will become besttarget shooter in this sniper hunter safari animal game. Thisadventurous wild hunter jungle shoot free game is a competitionbetween you and dangerous animals of the forest where you have touse modern weapons to kill them all. Realistic climate andsensational 3d graphics of this hunting jungle animal adventurewill develop your interest and this animal hunter game is a freegameplay contain the compatible user interface for shooting lovers.Probably you have played many deer hunting, lion hunting, andbull shooting game but this jungle animal shooter 3dgame is relatively advanced and modern mode of hunting. Youhave to use different weapons like pistol, rifles, guns, and sniperto shoot the animals and unlimited ammunition will amuse you whiletaking a gunshot to the target. Aim and shoot the wild jungleanimals and become the best deer/lion hunter. A jungle-likeAfrican jungle is here in sniper hunting game in whichdeers/lions and other wild animals are wondering, you have to findthem and hunt them. Different powerful guns and pistols areavailable for you which have different shooting ranges, you have toselect any gun according to your own choice and perform deerhunting. It is very adventurous, thrilling and risky game. You will hunt the wild lions/deers by putting your life into a bigrisk. Wild animals including elephants, lions, and other deadlydeeds can attack you and can kill you. You have to hunt them wiselywithout ignoring any side & any wild animal. Hunt the deersbefore they attack you and kill you. Use Powerful guns to shoot andkill wild animals. You will get real-time wild animals huntingexperience and you will become an expert hunter in theAfrican jungle. There are multiple hunts challenging levelsin this deer hunter game. All coming levels are more complexand more dangerous than previous one. You have to face thesechallenges and clear all complex levels. Safari huntergame is very realistic unique hunting idea. You will reallylike this safari deer hunting challenge 3D game. Simpleand easy gameplay than other deer hunting games on theGoogle play store. Everyone can play this deer shootinggame improve your lion hunting skills by playing thisreal hunting challenge 2018 game. Different kinds ofenvironments e.g. Snow, desert, mountains and jungle etc... inwhich you will hunt deers in this hunting challenge game. 6different challenging levels in each environment with increasingnumber of deers to play and complete. If you want to become bestjungle hunter then animal hunting game is waiting foryou. install deer hunter 2017 and enjoy its uniquefeatures. Main Features: * Different guns and pistols to usefor hunting. * wild animals including lions, elephants, wolfs,deers etc... in the safari jungle. * Different environmentse.g. snow, jungle, desert, and mountains. * 30 challenging levelsin each environment with increasing number of lions & deers. *Unlimited bullets in the guns are available in this animalshooter 3d game. * Set Aim to exact target to the animals. *zoom camera to clear the target. * 3D safari park adventurousjungle environment. * Simple and easy gameplay like shootingbutton, zoom camera button, joystick etc.